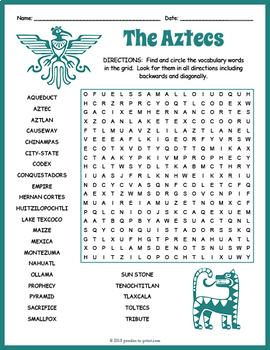 Your students will enjoy looking for all of the fun Aztec vocabulary words hidden in this puzzle worksheet. The words are hidden in all directions and there may be some overlaps making this a challenging word search. A great activity for early finishers or just for something fun to take home and enjoy. The 26 hidden vocabulary words are: aqueduct, Aztec, Aztlan, causeway, Chinampas, city-state, codex, Conquistadors, empire, Hernan Cortes, Huitzilopochtli, Lake Texcoco, maize, Mexica, Montezuma, nahuatl, ollama, prophecy, pyramid, sacrifice, smallpox, sun stone, Tenochtitlan, Tlaxcala, Toltecs, and tribute.